All images, text and data on this site are copyrighted unless otherwise noted. 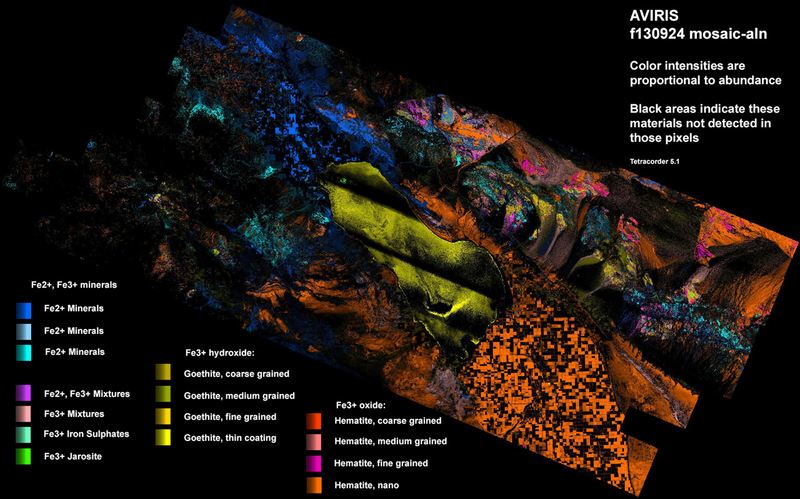 Detection and mapping of minerals, vegetation species, chemicals, liquids, and solids is being done through the field of imaging spectroscopy. Imaging spectrometers are deployed on aircraft, spacecraft (throughout the Solar System) in the field, and in laboratories. Imaging spectrometers collect a spectrum at each image pixel with enough spectral resolution to to resolve absorption and emission features in compounds, whether crystalline or amorphous solids, liquids and gases. What can be detected remotely is mainly a function of spectral range and resolution. Analysis of imaging spectrometer data sets is quite complex and the most advanced system system in existence is the Tetracorder system first described in detail in Clark et al. J. Geophysical Research in 2003 (PDF, 8.3 MBytes). The original, Tetracorder 4.4, is open source and available here: https://speclab.cr.usgs.gov/tetracorder.html. Tetracorder is in use analyzing data from all over the Solar System, including mapping ice and other compounds on icy satellite surfaces in the Saturn and Jupiter systems, minerals on Mars, and was critical in making the discovery of widespread water on the Moon possible. 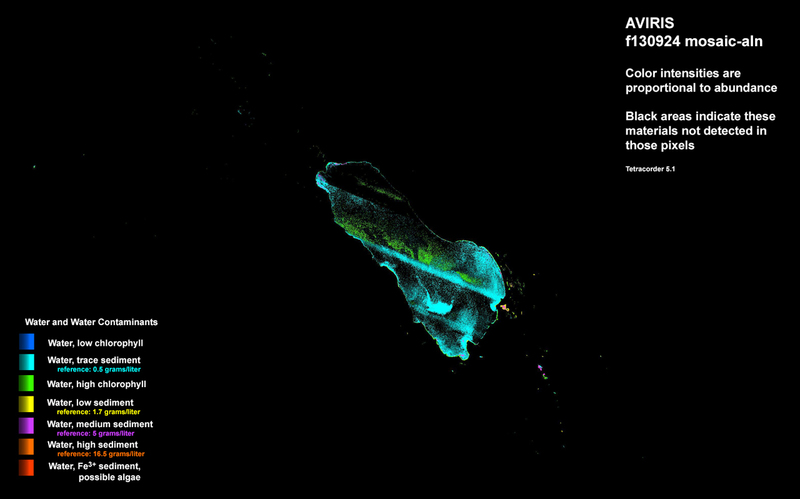 Tetracorder is used for mapping ecosystems, and in rapid response to environmental disasters. It was used in assessing the environmental damage from the World Trade Center disaster and the the 2010 Deepwater Horizon oil spill in the Gulf of Mexico. The original Tetracorder has been extended to detect more materials at lower abundances and cover a greater spectral range with automatic adaptation of sensor capabilities (currently Tetracorder 5.1). Tetracorder uses multiple algorithms, including spectral fitting procedures to identify materials, and derives feature strengths (relative abundance) of those materials. It has demonstrated discrimination of grain sizes for some materials using the shape of the absorption features. The grain sizes and feature strengths can then be fed into radiative transfer models to derive component abundances. Tetracorder 5.x+ adapts to both environmental conditions as well as instrument capability. Previous versions had to be adapted by an expert spectroscopist for each sensor and environment the data came from. Tetracorder produces maps of hundreds of materials, including chemical substitutions in some minerals. Imaging doing chemistry remotely, whether across a canyon, from a high point overlooking an environmental disaster, or a studying remote planets. This is now possible. Further, Tetracorder results can be made into custom color-coded maps automatically. Tetracorder 5.x is only available here by contract. If you have applications requiring Tetracorder analyses, contact R. Clark. 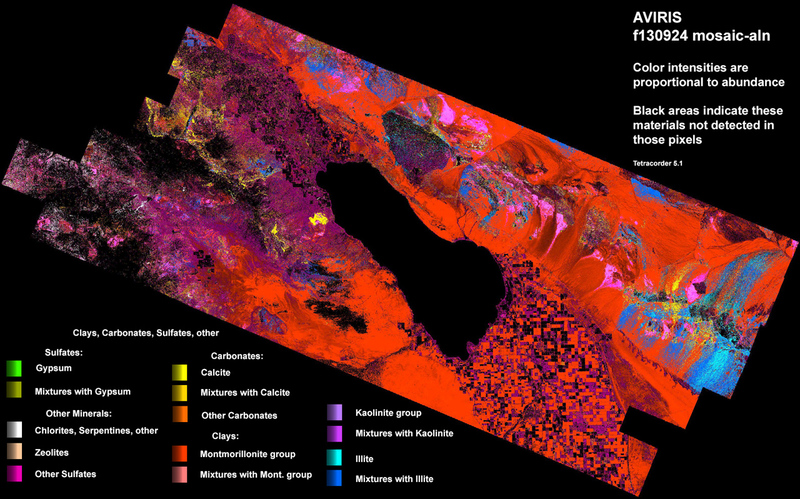 Examples of automated map production, a selection of materials identified and mapped in one region. Note: these are standard products. Map of clays, carbonates sulfates and other minerals. 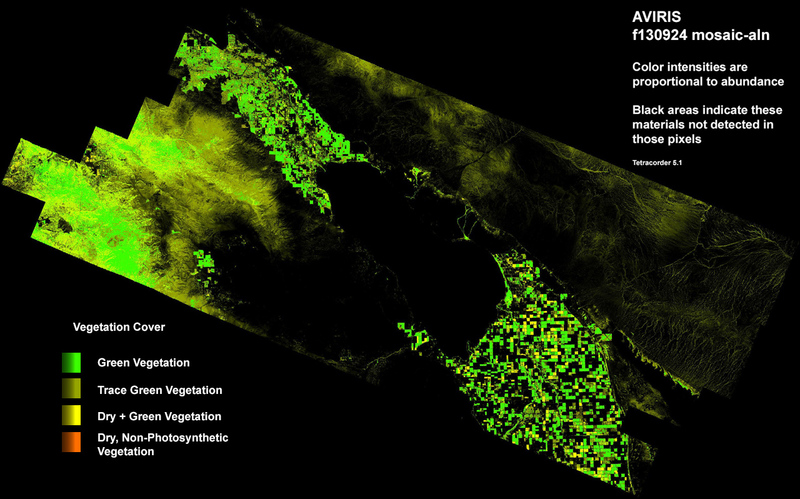 Map of vegetation cover. This is more accurate than the commonly used NDVI. 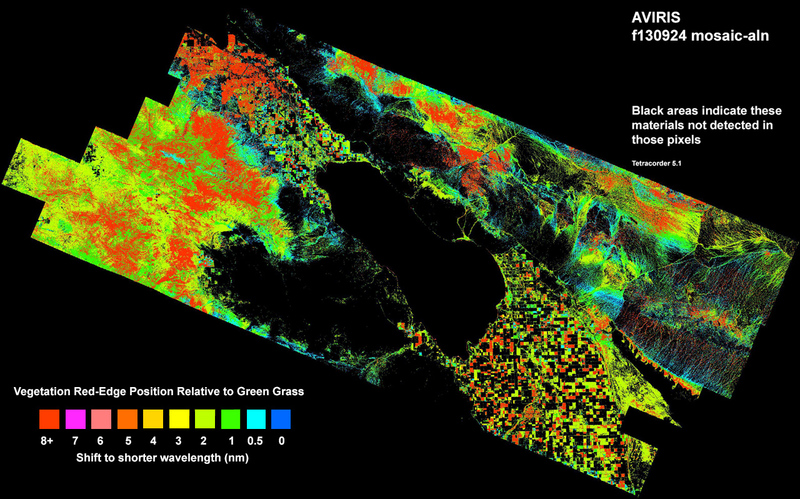 Map of the red-edge position of the chlorophyll absorption band in vegetation. Map of chlorophyll content in the lake. Note, no masking has been done to separate the lake from land. Tetracorder determined what areas are water solely by spectral content. Note, the striping is caused by offsets in the calibration of the data due to path radiance. First Published February 1, 2017.